Our meeting was opened by our Sergeant at Arms, Christine Morrell, who did a great job standing in for Neil Pettigrew and ensured that we were amply supplied with biscuits for the break! Our TMOD was Riya George who led the meeting with lots of enthusiasm and ensured there was plenty of energy in the room. We were entertained by a variety of interesting prepared speeches. First of all Richard Gardner gave his Icebreaker speech, in which he gave us some interesting insights into what it is like to be a novelist. Then John Cross, who appears to be a very experienced Monopoly player, gave us some useful tips on how to win the game during his illustrated speech # 8 from the Competent Communicator Manual. This was followed by a speech from Sue Shaw, who gave a speech from the Advanced Manual, Interpretative Reading. This is not an easy manual to undertake because you have to interpret the thoughts, ideas and emotions of someone else. In all the other manuals you are speaking your own thoughts and ideas. However, Sue made it look easy. In a speech titled, “Communion with God” she was reading one of Alan Bennett’s monologues, except that Sue did not need to read it – she had learnt it. Sue portrayed the thoughts and feelings of the heroine and connected emotionally with her audience. Martin Langdon was our Table Topics Master and, as he usually does, entertained us with his choice of noteworthy topics. 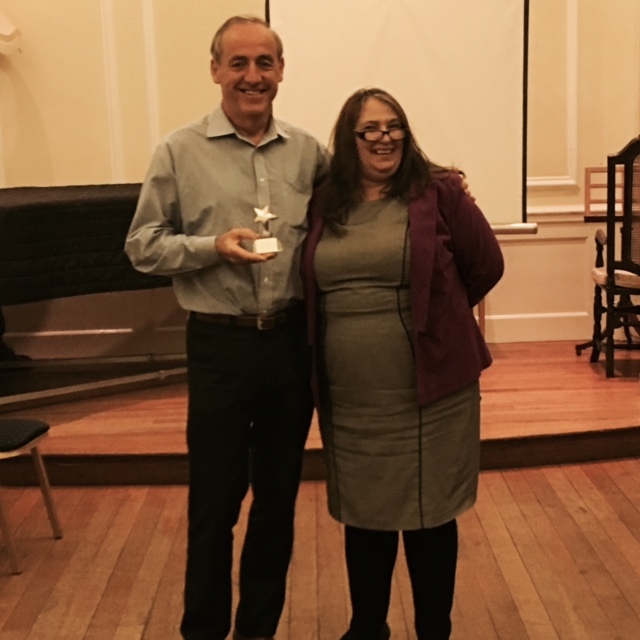 And the Best Speech Award went to Sue, for her excellent monodrama whilst the best Table Topic Award went to Jenny Taggart, who gave a very entertaining speech about a chicken. Our next meeting will be on Thursday, 29 September at 7.15 pm, which promises to be another entertaining meeting with some great speakers already lined up. And don’t forget our Area Contest, which will be held at Mind, 10 Altyre Road, East Croydon, CR0 5LA on Wednesday, 5th October at 7 pm. Judges are still needed, so please let a Committee member know if you would like to be a Judge at the contest. 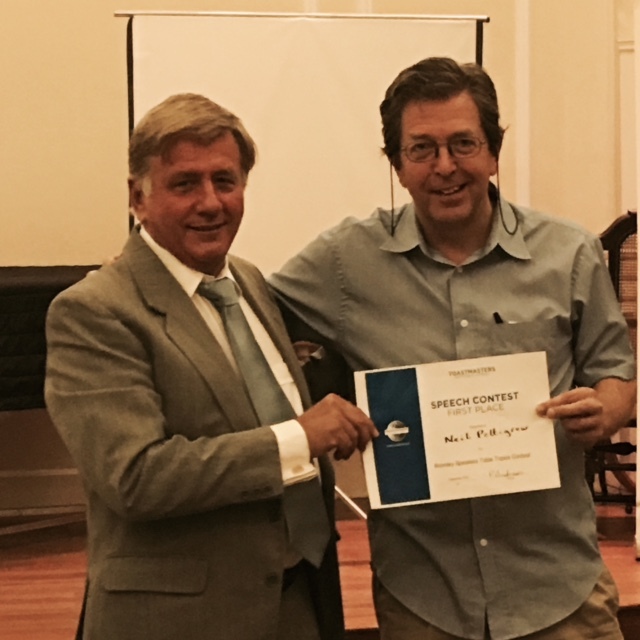 Thursday 1 September 2016 was the date for our Humorous Speech Contest when a fun time was had by all. The meeting was ably led by our Contest Chair, Susan Rayner, who warmed us all up by asking us to say what we liked about summer. This led us into the Humorous speeches. We had six contestants Ian Brett, Sue Shaw, Richard Murray, Alex Clark, David Henson and Neil Pettigrew. They entertained us with their humorous stories, which included a visit to the theatre, getting a Parking Ticket, a Voucher for a tattoo, playtime, the lyrics of a well-known song and a fairy tale. This led to some entertaining speeches and some diverse opinions about the topic from our contestants Sue Shaw, Alex Clark, Richard Murray, Paul Lynch, David Wilson, Neil Pettigrew, and Ian Brett. In between the two events Susan led a very lively debate about whether it was right that Apple Computers should pay so little tax. On one side of the debate we had Apple Executives and on the other we had Members of Parliament. This led to some interesting and heated speeches on the topic. This was a great idea as it meant that everyone could get involved with giving a speech – not just the contestants. The evening was finished off by giving a Certificate of Participation to all the contestants followed by giving Winning Certificates to the top three in each event. Table Topics: 1. Neil Pettrigrew, 2. Richard Murray 3. Sue Shaw. Humorous Speeches: 1. Richard Murray 2. David Henson 3. Sue Shaw. 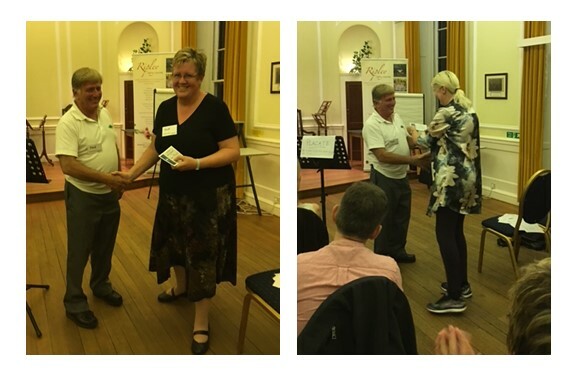 The winners Neil and Richard were also presented with awards by our Contest Chair, Susan. Neil and Richard will be going through to the Area Finals on Wednesday 5th October – please come along and support them. The Area Finals will be held from 7pm at the Mind Building, 10 Altyre Road, East Croydon. Finally, thanks to all the contestants, judges, contest chair and everyone else who took part and who helped to make this a fun, fantastic evening.